High Moon Studios says a patch for the PC version of Transformers: Fall of Cybertron should be out within the week. 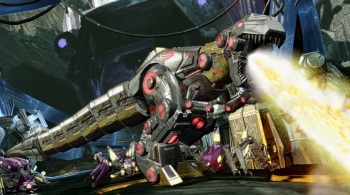 The PC version of Transformers: Fall of Cybertron apparently suffers from a few issues with its online action. It's hard to connect, it's hard to find people to play with and even if you are able to surmount those fairly fundamental problems, the game is plagued with numerous other technical difficulties of various sorts. It doesn't sound like the sort of thing that makes a game much fun to play. The situation is bad enough that Activision and High Moon Studios have issued a statement acknowledging the problems and assuring gamers that they're on the case. "Activision and High Moon Studios are firmly dedicated to providing a fun multiplayer experience in Transformers: Fall of Cybertron," they said. "We've seen some concerns from PC fans about the online experience and have been working hard with internal and external teams to address any issues." High Moon is currently testing a patch for the PC version of the game that would implement the same changes put into place by a recent update for the console versions, which includes "a number of small changes to the dynamic gameplay balancing and tuning." The studio also said it caught and fixed a bug with PC host migration that appeared just prior to the game's launch. I'm not sure how any of that relates to online connection problems, but hopefully it'll all work out when the patch finally hits. If all else fails, High Moon encouraged players with problems to seek assistance at Activision's Transformers: Fall of Cybertron support site. "Rest assured that we are looking at all user comments and questions," the studio said.